Home - News & Events - Our Biggest Event of the Year! Our Christmas Coffee Morning is our biggest event of the year and is just around the corner! There will be a raffle, tombola, guess the weight of the cake and lots of other ways to win some fab prizes, as well as tea/coffee and yummy mince pies, all while listening to some Christmas carols from the Ashbourne Singers. This event is open to everyone, so come and join the fun! 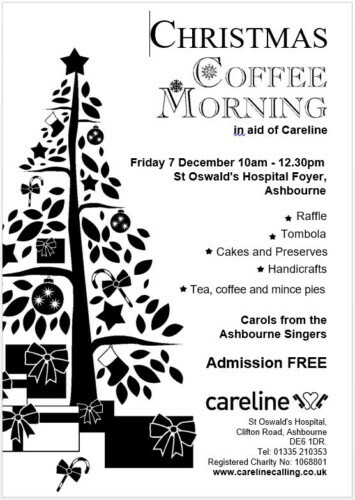 Held at St Oswald’s Hospital, Ashbourne, Friday 7th December, 10am-12:30pm.